At Bryant Park, we pride ourselves on always pushing our park offerings to be the best they can be. From adding yoga workshops to our extraordinarily popular yoga classes, to expanding the Square Dance each year to make it even more fun, to making incremental improvements to our activity areas, we're always looking to challenge ourselves to give the best park experience possible. Some of our inspiration for improvements and additions come from the outside world. For example, the idea for our Kubb area was conceived when our Executive Director, Dan Biederman, went on vacation with his family in Scandinavia and saw the game being played. Kubb is not well-known outside of Scandinavia (or areas of the United States, like the Midwest, that were settled by Scandinavians). Many park guests look curiously at the intriguing lawn game, which resembles a combination of bowling, chess, and pool. We answer the question "What is Kubb, anyway?" in this blog post. Dan Biederman took this photo, documenting the unusual new game he thought would be a great addition to the park. Kubb in the park started with a low-to-the-ground experiment--just because we thought it was a good idea didn't necessarily mean the public would agree! 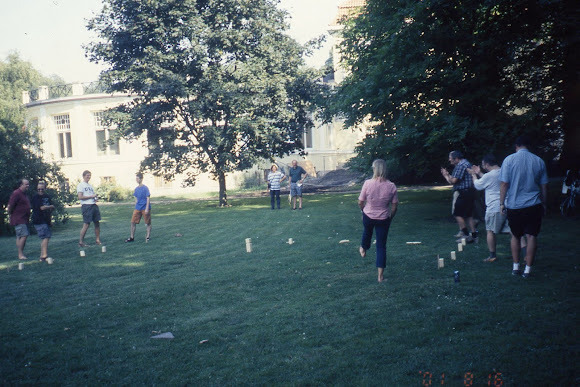 We purchased several Kubb sets and set up Kubb fields on the lawn during select times. Though many people passing by the game were not familiar with it, the rules were easy enough and the game enjoyable enough that many stayed, played, and wanted more. Kubb's existence in the park was formalized when The Green opened in 2013, hosting a Putting Green on one side and a Kubb field on the other, The Green was Kubb's permanent home. In 2014, the first-ever Bryant Park Kubb tournament was held on the lawn, and this summer we've scheduled three tournaments to meet the growing demand for friendly competition. The final tournament of the season is on September 30; register here.